You know how there are some plants you just can’t grow, no matter how often you try? For the longest time, I drooled over pictures of sea kale (Crambe maritima), and I desperately wanted to grow it. I bought plants, I grew them from seed, but I couldn’t get them to last more than a year. Eventually, though, I found what I consider a great substitute: couve tronchuda. 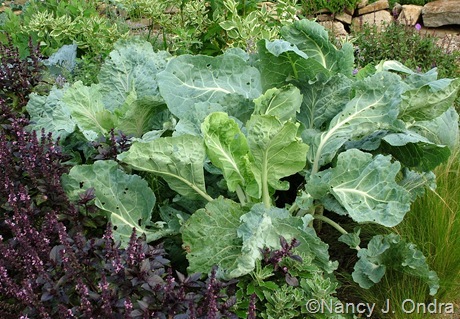 Also known as Portuguese cabbage or Portuguese kale, this cabbage relative produces a stout, upright stem to about 2 feet tall, with broad, wavy, light green to blue-green leaves with thick, white stalks and veins. 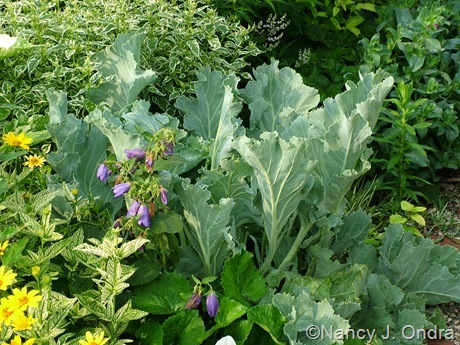 A single plant fills a space about 2 feet across by the middle of the growing season. Couve tronchuda is usually grown as a vegetable for its sweet, cabbagey leaves and crunchy leaf stalks, but it’s handsome enough to serve as a foliage accent in ornamental beds and borders. It looks great with whites and pastels, and with rich greens too, and the broad leaves contrast handsomely with tiny or spiky blooms. Sometimes the plants produce an abundance of white blooms toward the end of the growing season; sometimes they overwinter and flower in their second spring to summer. The flowers are cute but not nearly as striking as the foliage. 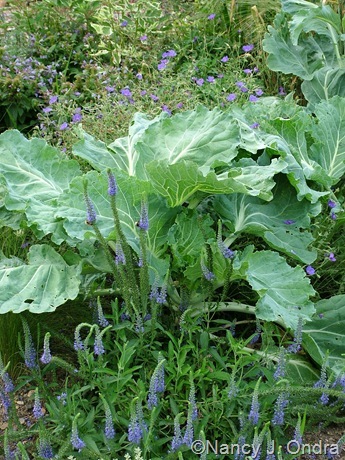 Couve tronchuda is as easy to grow as a heading-type cabbage. For seeds, check out the cabbage page at Kitchen Garden Seeds (look for Beira Tronchuda Cabbage). You need only a few plants each year, so just one packet can last for several years. I usually start mine indoors in mid-March and set out the seedlings about 18 inches apart in early to mid-May, in full sun or light shade. The plants don’t need any special care, but you’ll need to watch for cabbageworms, because they can quickly chew the leaves into lace. You can remove the larvae with daily hand-picking (though it’s tough to find them, because they blend into the foliage so well), or you could spray with BTK (Bacillus thuringiensis var. kurstaki). And wouldn’t you know: Now that I stopped trying so hard to grow sea kale, I actually have a nice clump of it (above). The very last plant I tried decided to take hold, and it’s even large enough to flower. But I’ll still keep growing couve tronchuda too, just in case the sale kale gives up again. Couve (Brassica Oleracea) is very common in Brazil and Portugal and is also known in Us as Collards (Georgia Southern or Crole is an American variety). In Brazil we usually prepare couve to eat with the famous feijoada. I so want some tronchuda! I’d like to try and make cabbage rolls with it. Sea kale also! It looks so yummy when it’s blanched. But I have yet to try it. Although I love anything in the Brassica family. Feel like sharing any seeds? 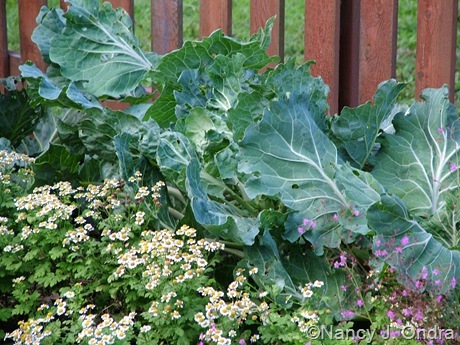 I can imagine that the large leaves would be perfect for making cabbage rolls. Unfortunately, I don’t have any seeds to share, because I haven’t overwintered the plants for the last two years. I’ve seen it listed in several U.S seed catalogs recently, though, so it should be too hard to find. Good luck!